In November of 2004, Sabine and I adopted a 2.5-mile stretch of northbound Highway 280 in San Jose, California. 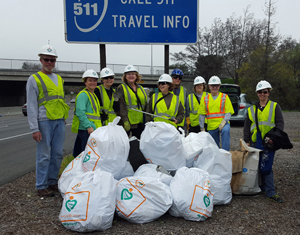 We are officially part of the California Adopt-A-Highway program. Our assigned area is the north side of Hwy 280 between the Meridian Avenue and Saratoga Avenue. If we have enough crew members, we also work on the Meridian-Southwest-Expressway interchange. We also try to keep Moorpark and Parkmoor between Bascom and Leigh clean because they are de fact on-ramps and off-ramps in this area. We work from 9:00 to 12:30 one Saturday each month. A couple of times a year, we take on The Alameda exit on northbound Highway 880. Want to get involved? Email me at loui@louitucker.com if you'd like to join a work crew. Photographic proof that some people are slobs!